2095183 1250:1 100 .006" .0001" 100/2.54 +-.002"
2095184* 2500:1 50 .003" .00005" 50/1.27 +-.001"
2095185* 5000:1 20 .0015" .00002" 20/.50 +-.0005"
2095186 10000:1 10 .0006" .00001" 10/.25 +-.0002"
2095189 20000:1 5 .0003" .000005" 5/.12 +-.0001"
2095195* 4000:1M 50 .003" .000025" 50/1.27 +-.001"
2095196* 8000:1 20 .0015" .000010" 20/.50 +-.0005"
2095197 8000:1 10 .006" .000010" 10/.25 +-.0002"
2095198 16000:1 5 .003" .000005" 5/.12 +-.0001"
Uses regular shop air (40 -150 psig). 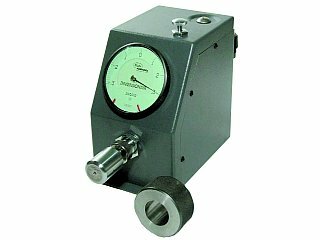 Internal pressure regulator keeps measuring pressures within calibrated range. Adjust meter to zero using a single setting master and the zero setting screw. High visibility meter has fine line graduations and a needlethin hand for clear, precise readings. An air filter is included to remove dust and dirt contaminants from air line. Tooling mounts to the front of the unit. Connections are tight with finger pressure. No recalibration necessary when changing tooling. Just set zero and measure! Models available in 5 magnifications, 2 dial styles, and either Metric or Inch.